Now making presence on social media is essential step for any type of business. A successful blog’s base is it’s connection with readers on internet. So for a blog making presence on Social media platform is must. It connects you with your readers and make your brand value. As those readers read and share your content on social media, your article reaches to new readers and more readers subscribe to your blog. No doubt, Facebook is the one of the biggest social networking website on internet. Almost every big and medium scale business is promoting themselves on facebook. Making a facebook page is an important work for a successful blog. This increases your brand value and you got a page dedicated to your contents. As facebook is very bust site, it’s good to make your page as soon as possible because someone other can take the personalized URL which you would like to do. 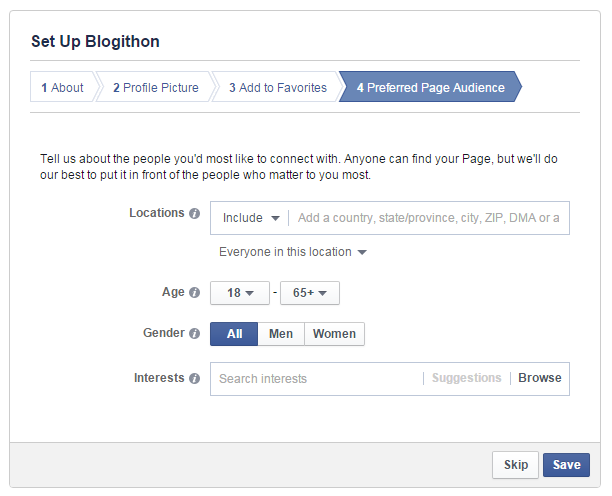 Here i’ll show you how you can make a facebook page for your blog. First log in to your facebook account and then go to “Create Page” link. Click on “Brand or Product” option. In choose a category dropdown menu select website option. In Brand name or Product text box write your blog’s name. Click on Get Started button. Now facebook will run a wizard to setup your facebook page. First it’ll ask you about your product’s information. Give some info about your blog and then write your blog’s full address. Choose a nice professional looking facebook unique web address, because after you set here, it can only be changed ones. Click on save info button. Now Upload a good profile picture for you blog. i will suggest use your brand logo. Make sure it’s medium size. Very small size picture will look blurry. Click Next. 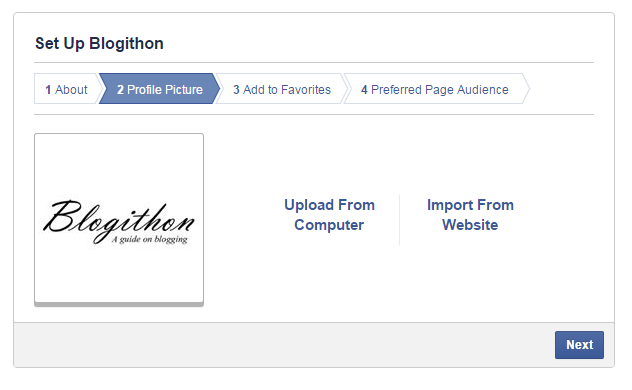 If you want to show your page on your Facebook homepage’s favorites section, click on Add to favorites or click skip. 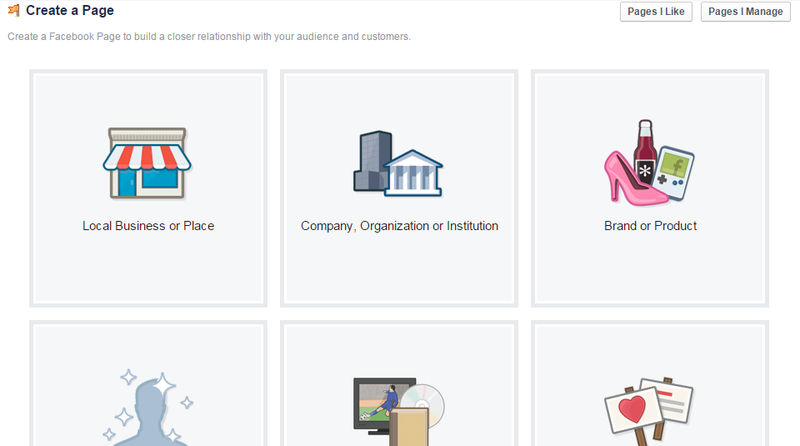 Facebook will ask to set preferred audience for your page. You can setup anyway you want according to your needs. if you are confused just hit save, facebook will automatically set it to default setting. After all these steps you have your own facebook page. You should create a nice professional cover image and upload it on your blog. Invite your friends to like your new page. 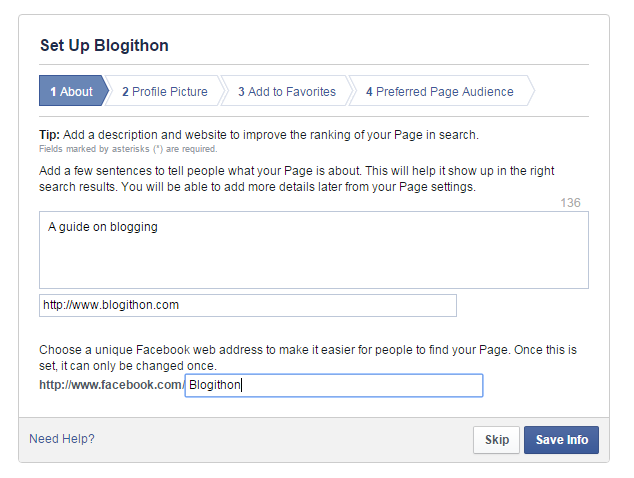 Regularly post and share your blog’s contents on your facebook page. If you have any questions, feel free to ask via comments. Subscribe to our newsletter and share this post on Facebook, twitter and other social media sites.